Early into the study of alcohol abuse, a theory was proposed that described the decline into full-blown alcoholism. This theory divides the progression of alcohol addiction into 4 stages. The theory is widely recognized in the treatment of alcohol abuse. The 4 stages of alcohol addiction. How to find a recovery center. Who Answers? to speak with a treatment referral specialist about recovery programs for alcohol abuse. Elvin Morton Jellinek, or E. M. Jellinek, was a biostatistician and alcohol abuse researcher who gained widespread attention with his revolutionary way of looking at alcohol addiction.1 In 1960, he published The Disease Concept of Alcoholism, which proposed the now widely accepted disease model of alcohol addiction.1 He viewed alcoholism as a chronic, relapsing condition that required professional health treatment. Jellinek developed a theory on the progression of alcoholism through various stages, largely defined by the damage observed in the body.1 Not every person struggling with alcohol abuse will go through the phases or display all of the symptoms. But the stages can help some people assess their alcohol consumption and prevent future problems. The “symptomatic drinking” stage describes a point during which a person uses drinking as a way to cope with a current problem.4 The person may begin drinking socially and be trying to deal with stress, manage emotions, or simply supplement a sociable lifestyle. As a person drinks more often, he or she starts to develop a tolerance to alcohol’s effects, meaning the brain grows accustomed to the presence of alcohol and the subjective effects seem diminished. 10 The problem is that the physical damage continues to accumulate, and these seemingly reduced psychoactive effects can lead to more frequent and higher doses of alcohol. Jellinek’s proposed “prodromal” or transitional stage of a drinking problem refers to the development of a cyclical pattern of alcohol abuse. 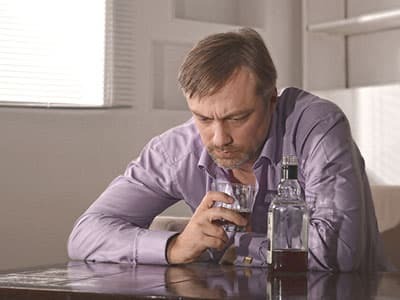 The user’s drinking habits begin to cause additional problems, which he then faces only with additional, excessive drinking.4 These problems can involve relationships, health, or school and work neglect, and the person copes with negative emotions by returning to alcohol use. This pattern of excessive alcohol consumption is self-perpetuating and leads to more complications in the long run. The “crucial” stage of Jellinek’s theory involves the escalation of symptoms from the prodromal stage.4 The user’s drinking becomes more frequent, and he or she may even start mornings off with a drink. This desire to begin hiding, rationalizing, or masking alcohol use can lead to further alienation from family, friends, and work. Jellinek proposes that drinking may begin to occur predominantly alone or in the presence of other alcoholics that will affirm a person’s unhealthy habits. Excuses for drinking and a sense of loss of control are two major parts of the theory behind this stage. Jellinek believes that up until this final stage, the person has had control over his or her decision whether or not to have the first drink. However, once that first drink is consumed, the person loses the ability to limit consumption.4 He theorizes that this final stage of alcoholism involves complete loss of control: the user must drink. This final, “chronic” stage of alcoholism is characterized by the progression of disease and psychological decline associated with drinking.4 Prolonged periods of intoxication can lead to ethical deterioration, severe memory problems, bodily damage, and irrational fears and resentments. 10 Some users may experience a potentially deadly withdrawal condition known as delirium tremens, in which seizures and hallucinations are common. Jellinek theorizes that in this stage, people will prioritize maintaining a constant supply of alcohol and sacrifice social, occupational, and cognitive functioning. If the user does not seek help by this stage, they run a very high risk of drinking themselves to death. Following Jellinek’s theory on the stages of alcoholism, a man named Max Glatt developed a theory about recovery from alcohol abuse.5 This theory built upon Jellinek’s work, but it lacked any real supporting data.6 Since its publication in 1958, some supporting evidence has come to light. 7, 8 Glatt’s model is generally used to describe the spiritual growth aspect of Alcoholics Anonymous. Recovery is rarely linear or sequential, so Glatt’s recovery theory is often presented as a curve, with the downward slope representing the deterioration into alcoholism and the upward slope signifying progressive recovery. Many people will struggle with relapse and loop back through earlier stages. The user hits rock bottom, feeling entirely hopeless and in desperate need of a way out. The user feels a strong and honest desire to get help, and does so. Alcohol use is stopped, spiritual needs are examined, and the possibility of a new way of life without alcohol becomes possible. Physical issues associated with drinking are addressed and begin to improve. The recovering drinker feels a renewed sense of hope and self-esteem, develops realistic thinking patterns, and fosters stability in his or her relationships with friends and family. The drinker’s sense of self-control over behavior and emotions improves. New interests and sober-minded relationships are developed, and fulfillment within society increases. Continuing therapy in both a group and individual setting strengthens life improvements, and the recovering alcoholic recognizes a new, enlightened way of living. 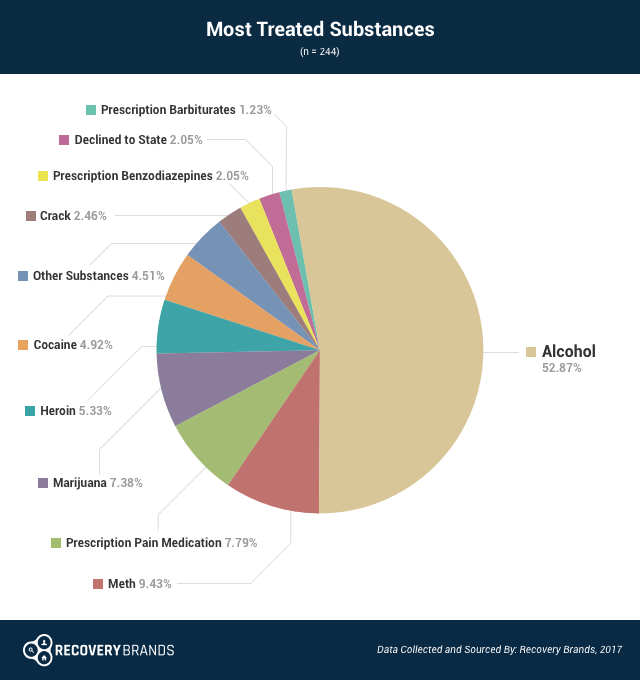 Ethanol (alcohol) is the most abused substance in recovery treatment attendees, as reported by a 2017 survey from Recovery Brands. The survey found that 68.85% of respondents received treatment for an alcohol abuse problem, and a surprising 52.87% of those that responded reported seeking treatment for a problem with alcohol more than any other substance. Who Answers? to join countless others on the path to recovery from alcohol abuse. Those with alcohol abuse problems can seek help through a number of programs. Treatment facilities offer the most structured start to sobriety, with options for both live-in or live-at-home treatment. Inpatient. Live-in or inpatient treatment involves an extended stay at a sober treatment facility with 24-hour support. The length of stay and program services are catered to individual needs. Therapy and counseling in both a group and individual setting can help recovering alcoholics understand their own patterns of abuse and find healthier coping mechanisms to deal with future stressors, including relapse. Outpatient. Live-at-home or outpatient treatment allows the person to continue to live in the comfort of his or her own home and work or go to school while attending regular, weekly treatment sessions at a facility. This treatment option is generally less expensive than inpatient programs. Those enrolled in outpatient programs will benefit from having a strong support system at home. 12-step programs. Alcoholics Anonymous (AA) is another option for recovering drinkers. This is a nationwide support organization that provides free sessions to encourage recovery from alcoholism. It focuses on a spiritual transformation, much like Glatt’s recovery curve model. Members attend regular meetings to discuss the program’s 12 steps to recovery, and new members may seek the help of a sponsor who is further along in the steps, allowing for accountability and mutual support. Professional treatment can make a world of difference for a person struggling with alcohol abuse. If you suspect that you or a loved one has a drinking problem, call 1-888-319-2606 Who Answers? to speak with a recovery program placement specialist about starting your upward path to recovery today.
. Page, P. B. (1997). E. M. Jellinek and the evolution of alcohol studies: a critical essay. Addiction, 92(12). 1619-1637.
. Shaffer, H. J. (1985). The disease controversy: of metaphors, maps and menus. Journal of Psychoactive Drugs, 17(2). 65-76.
. Fingarette, H. (1988). Heavy drinking: The myth of alcoholism as a disease. London, England: University of California Press.
. World Health Organization. (1951). Expert committee on mental health: Report on the first session of the alcoholism subcommittee. World Health Organization Technical Report Series, 42. 1-24.
. Glatt, M. (1958). Group therapy in alcoholism. British Journal on Addiction, 54. 133-143.
. Venner, K. L., Matzger, H., Forcehimes, A. A., Moos, R. H., Feldstein, S. W., Willenbring, M. L., & Weisner, C. (2006). Course of recovery from alcoholism. Alcoholism: Clinical and Experimental Research, 30(6). 1079-1090.
. Forcehimes, A. A. (2004). De profundis: Spiritual transformations in Alcoholics Anonymous. Journal of Clinical Psychology, 60(5). 503-517.
. Forcehimes, A. A., Feldstein, S. W., & Miller, W. R. (2008). Glatt’s curve revisited: a pilot study investigating the progression of recovery in alcoholics anonymous. Alcoholism Treatment Quarterly, 26(3). 241-258.
. Indiana Judges and Lawyers Assistance Program. Addiction and recovery: The Jellinek curve.
. McCrady, B. and Epstein, E (eds.). (1999). Addictions: A Comprehensive Guidebook.